For over five years, the Four Monkey Killer has terrorized the residents of Chicago, torturing his victims before he kills them. When he himself is killed in a freak bus accident, police are horrified to learn that at the time of his death the killer was on his way to deliver one final message, which proved he had taken one last victim, who might still be alive. When lead detective Sam Porter, who is battling his own demons, discovers a diary on the killer’s body, he instinctively knows that the murderer though dead is not finished. With only a handful of clues, the Four Monkey Killer taunts police from beyond the grave. Detective Porter soon finds himself caught in the mind of a psychopath, frantically attempting to decipher the killer’s ramblings in hopes of finding his last victim before it’s too late. 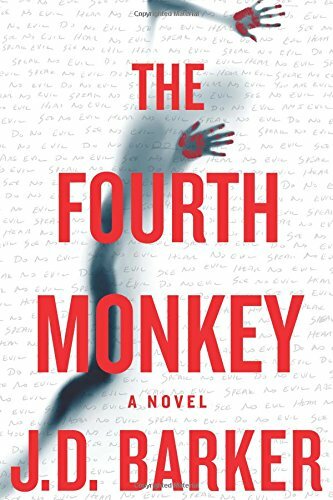 J. D. Barker’s new novel, The Fourth Monkey is a delightfully twisted and thoroughly engaging crime thriller that takes a spine-tinging peek inside the depraved mind of a serial killer. Barker is the international bestselling author of Forsaken and a finalist for the Bram Stoker Award. The Fourth Monkey’s plot effortlessly and succinctly alternates between Detective Sam Porter’s investigation and the serial killers diary entries. Porter has been pursuing the FMK for many years and desperately hopes to outmaneuver the deviously clever murderer before time runs out. The killer’s diary entries are terrifying and spellbinding, and outline’s how and why he became a monster. Overall, The Fourth Monkey is a highly recommended and beguiling page-turning thriller that is both disturbing and immensely entertaining. It is filled with creepy atmosphere and plot twists that skirt the bounds of moral ambiguity. The reader must be warned that this is an extremely violent and graphic novel that’s not for the faint of heart. But if that’s your cup of tea, you will not be disappointed.